A year and a half ago, former Wisconsin Governor Scott Walker (I still love saying that!) penned a handwritten note with Foxconn promising the company $3 billion dollars for a manufacturing plant they were so supposed to build in Wisconsin and to create 13,000 jobs. Both Walker and Lyin' Paul Ryan immediately made this cornerstones of their reelection campaigns. Ryan ended up quitting and running off with his tail between his legs and Walker was fired in the midterm elections. Critics immediately raised the alarm, citing the disaster in Pennsylvania where Foxconn just took the money and ran, leaving taxpayers in the lurch. 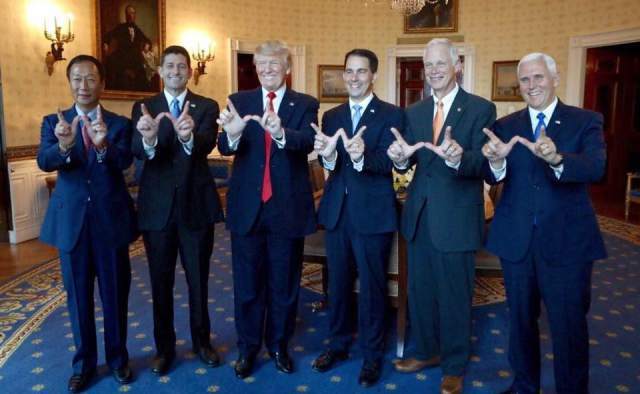 It didn't take long for the wheels on the Wisconsin deal to come flying off either. First the number of jobs being promised dropped from 13,000 to maybe 2,000 if we were lucky. Meanwhile, the $3 billion in state aid quickly blew up to over $4.5 billion in state and local aid, with Foxconn, sensing they had some real suckers on their hands, kept asking for more and more. "In terms of TV, we have no place in the U.S.," he said in an interview. "We can't compete." Indeed, Foxconn has already suspended all construction. "We don’t blame Foxconn for altering plans in an ever-changing technology business. It’s also not surprising Foxconn would rethink building a manufacturing plant in Wisconsin under the Evers Administration," Assembly Speaker Robin Vos and Senate Majority Leader Scott Fitzgerald said in a joint statement about the company's plans. The Taiwanese tech giant attributed its deliberations to high labor costs and not to the election of Evers. Though Woo told Reuters the company had concerns about the steep cost of making advanced TV screens in the United States, the Republican leaders said, "the company is reacting to the wave of economic uncertainty" brought by Evers. "Governor Evers has an anti-jobs agenda and pledged to do away with a successful business incentive for manufacturing and agriculture," Fitzgerald and Vos said, referring to Evers' proposal to pay for a middle-class tax cut by scaling back a tax credit for manufacturers and agriculture producers. Like everything else that comes from the Republicans, this doesn't hold water. It was Vos and Fitzgerald that called for the extraordinary session after the midterm elections to pass a slew of lame duck laws, including the protection of their Foxconn con game. Foxconn earns state tax credits based on actual investment and job creation. No jobs/investment? No credits. Period. What Walker doesn't want people to remember is that as of one year ago, he already handed over more than a billion dollars to Foxconn that had absolutely nothing to do with job creation. Not only are Republicans no good at leading, but they don't even make good liars anymore. Governor Evers stated in his campaign that he would stop Foxconn if he were elected. Looks like he's doing it!! I am certain you are incorrect. Governor Evers did NOT say that. You might want to update this. Then again, you might not want to. You aren't even so weak and stupid to buy Trump's and Foxconn's BS, are you WHAAAA-ska? Now get back to your effort to pull 10% in 2 1/2 weeks. You're a funny man, Blaska. My question for you, o gullible one, is who's conning whom? They thought Walker would win and the money would keep coming. Now that the free money is done they want to quit.